“Post-Impressionist artist Paul Gauguin (1848-1903) was an innovative and influential artist, known for his unconventional lifestyle, personality and longing for a more natural way of life,” a Marie Selby Botanical Gardens news release says. From Feb. 10 through June 30, Gauguin: Voyage to Paradise will be on view at Selby Gardens, offering “the rare opportunity to experience a selection of captivating works by the artist, alongside lush horticultural displays of tropical plants that inspired him in French Polynesia,” the release points out. A key figure in the Parisian avant-gardeart world — which included Vincent Van Gogh and Paul Cézanne — “Gauguin rejected traditional artistic hierarchies in Europe, identified as a self-styled ‘savage’ and traveled extensively to the South Pacific on a romantic quest for a paradisiacal land far from the ills of urban life,” the release continues. “Ten original dramatic woodcuts, wood engravings and lithographs that Gauguin created on his journeys to Brittany, Martinique and Tahiti will be the centerpiece of the Museum of Botany & the Arts, along with photographs, historic maps and postcards,” the release points out. “These works are on generous loan” from the Israel Museum in Jerusalem; Smith College, Bates College and private collectors Keith and Linda Monda of Sarasota and Dennis Powers of New York, the release notes. 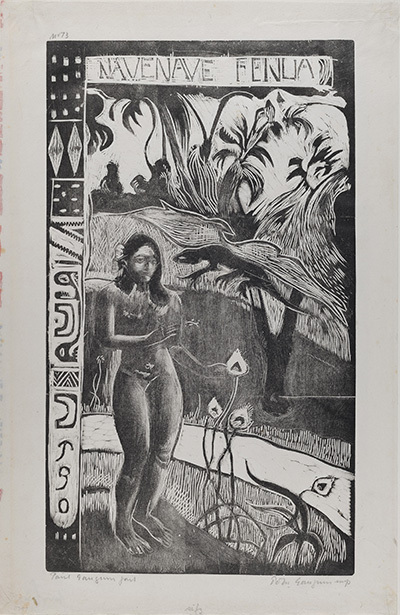 The exhibit will provide a comprehensive focus on Gauguin’s woodcuts and his connection with nature, “a viewpoint on Gauguin that has never been exhibited in a natural setting before,” the release adds. “Living displays throughout the gardens and in the glass house conservatory will showcase rare and spectacular plants from the tropical regions that figure prominently in [Gauguin’s] repertoire,” the release says. Among the elements that will be used in the vignettes and throughout the Gardens will be “artfully-placed canoes filled with tropical plants, planted native masks and coconut installations; patterned tapa-cloths; bamboo features; Tahitian marae totems and Marquesas totems surrounded by masses of sumptuous flowers,” the release notes. “Gauguin: Voyage to Paradise is the third installment of the ongoing, record-breaking Jean and Alfred Goldstein Exhibition Series at Selby Gardens, which explores the rich connections between nature and the arts,” the release adds. Admission to Gauguin: Voyage to Paradise will be included with all-access admission to Selby Gardens: $25 for adults; and $15 for children ages 4 to 17. Admission is free for members. A Selby Gardens membership is the best bargain in Sarasota.